There are times when property owners may find themselves faced with the dilemma of choosing whether to renovate their property or have it totally rebuilt from the ground up. This predicament is what we call a ‘raze or raise’ problem. And here at Doug Pruett Construction Company, we carefully assess our clients’ existing residential or commercial property to give them an accurate advice on whether it’s better to rebuild instead of just renovate. So if you have a similar problem right now, please feel free to contact us and we will help you come up with a sound decision and enforce it accordingly. There are many Maryland homes that were built on low-lying areas, making them highly prone to being flooded. In the event that a home was flooded, the potential damages could be catastrophic. In such case, it is better to act on the matter before such an eventuality occurs. If your property is constructed in a flood-prone area, we suggest having it raised and remodeled. We have the tools needed to carry out such project with very minimal inconvenience on your part. We will first raise your house and put support underneath. Afterwards, our workers will construct a new foundation that is considerably higher and sturdier than the old one. We will then lower your house down to the new foundation and perform the necessary renovation jobs to ensure that your house is 100 percent livable. A raise job typically lasts for a week or two, depending on the work needed. 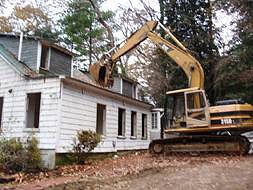 It’s relatively cheaper to have than a raze job, since the latter involves a total rebuild of an existing property. You also have the option to have your property redesigned to achieve a brand new look. A raised property is also much safer from the risks of being flooded than when it is still on its old foundation. Overall, raising a home is a really cost effective way of ensuring the safety of a property. Meanwhile, there are instances when the existing property is already badly damaged that simply raising it won’t be practical. In such case, a raze job is in order. This is done by totally demolishing the entire property and building a new one. Although it will cost you more at first glance, it could actually be a cheaper way than spending on separate or staggered renovations for the decayed or damaged portions of your property. A raze job naturally takes longer to complete and requires more manpower than a raise job but if the end result is a totally great looking and much safer property, then it’s definitely worth all the hassle. We are a trusted remodeling company and building/demolish contractor in Maryland, so you’re guaranteed that your property will be handled by industry certified professionals. Call us right now and let us raze or raise your property depending on the needs. Many locations in Anne Arundel are low lying and subject to water incursion or need more space beneath. 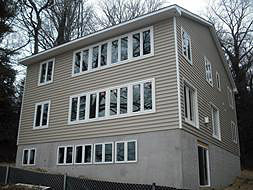 Here is one example of some remodeling jobs that began with the house being raised, a new foudation built beneath, then the house lowered back down to an inreased height. In some cases it is more efficient to totally demolish and rebuild. This waterfront was in too decayed a condition to remodel. While maintaining the same footprint, the homeowners gained 3 levels of livable space to include 4/5 bedrooms and 4 baths.